Something stirred inside the carefully cultivated cocoon of ignorance at Richard Treadgold’s Climate “Conversation” blog, but I don’t think it was the butterfly of understanding preparing to inflate its wings. Something much more subterranean, I suspect. Needled by my post about said cocoon (namely, Treadgold’s insistence that “global warming has not happened for about 15 years, unless you take a micrometer to the thermometer“), RT issues a bold challenge: Well, where’s your evidence, Renowden? The graph that proves no significant warming for about 15 years — since about 1996. Measured by satellite, not the unreliable hand of man. 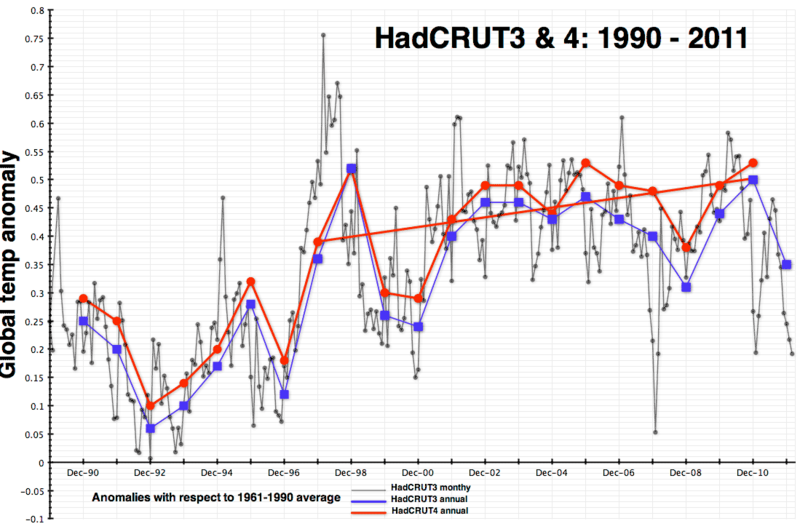 The HadCRUT3 global series is most assuredly not a satellite generated temperature record. But we’ll let that pass, shall we, and take a quick canter through an answer to his challenge. I shall ignore Mark Twain’s advice just this once, in the hope that some light may shine in to the dark corners of his misunderstanding. 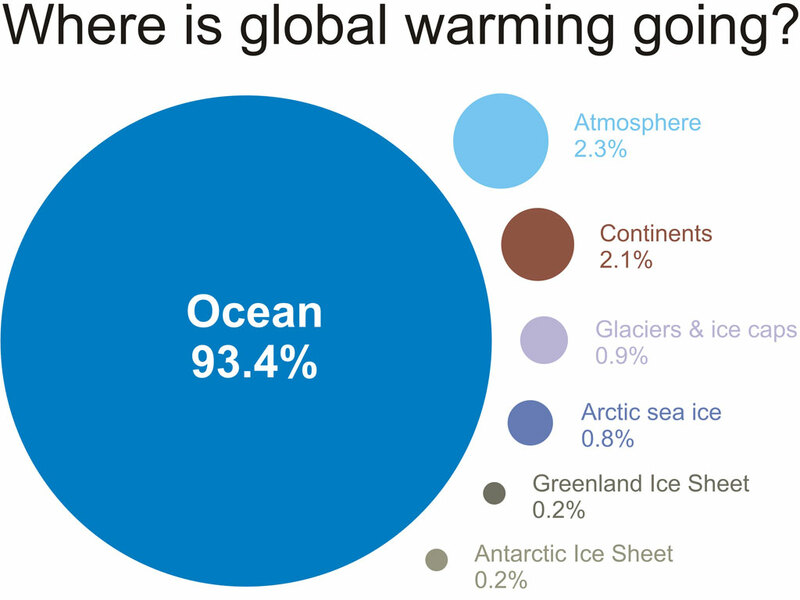 The first, and most important thing to do is to define what we mean by global warming. Here’s my stab at a definition: the accumulation of energy in the climate system caused by increasing concentrations of greenhouse gases in the atmosphere. We know that CO2 and other GHGs are accumulating in the atmosphere, and we know where they’re coming from: we did it. The energy comes from the sun, and when the earth is neither warming nor cooling, the amount reaching the earth’s surface is balanced by the amount being radiated back to space. So how do we measure the accumulation of energy in the system? It’s obvious — more energy means (to a first approximation) that everything will be getting warmer. So let’s take a look at where most people live — on land. Yup. Looks like we’re warming. Even — perhaps especially — over the last 15 years1. The graph says a lot, but perhaps the most obvious has to do with variability. Monthly global averages bounce up and down a lot. When you look at annual averages, you smooth the data quite a lot (because you’re taking 12 months and bunging them together), and this allows you to cut through the noise. Look at the monthly data (the grey line). It’s difficult to eyeball that and get a feel for any underlying trend. There’s too much wiggle going on. That is, of course, why Treadgold and his compatriots in climate denial like to present the data in that fashion: it confuses the issue. The annual averages paint a less detailed, but more comprehensible picture. It’s pretty clear that warming has not stopped in either series, but most certainly not in HadCRUT4, where both 2005 and 2010 are warmer than 1998, the HadCRUT3 warmest year. In both series, it’s obvious that the 2000s were warmer than the 1990s3. The red line through the last 15 years of HadCRUT4 data shows quite clearly that the trend remains upwards. But where do all these wiggles in the temperature come from? We saw earlier that the oceans are the biggest player in the global energy budget, and its well known that ocean cycles such as the El NiÃ±o Southern Oscillation (ENSO) can have a marked effect on global average temperature. El NiÃ±o events push a lot of heat into the atmosphere and create warm months and years, while La NiÃ±a events do the reverse. 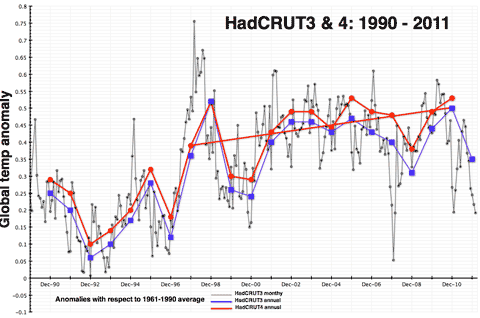 The 1998 spike in the monthly HadCRUT3 is associated with one of the strongest El NiÃ±o events in the record. Other sources of up and down influences are the 11 year solar cycle (warming and cooling) and volcanoes (cooling). 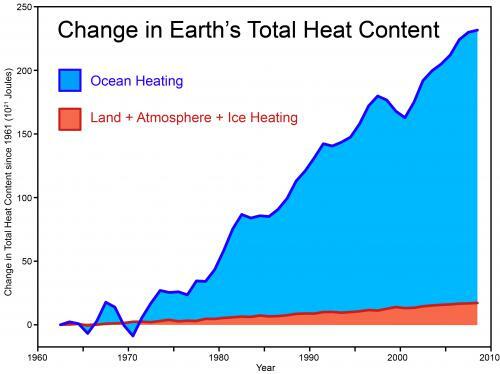 Undeniable warming — or warming that’s undeniable to people that live in the real world. The bottom line: global warming cannot stop until the greenhouse gas concentration in the atmosphere has peaked, and the climate system has had a chance to reach equilibrium — which will take 30 years as the oceans warm up4. Monthly and annual global average temperatures will continue to wiggle around the long term trend as ocean cycles move heat around, but barring major volcanic eruptions or the intervention of aliens, the accumulation of energy will continue until the planet is back in energy balance with space. It’s interesting to note that Treadgold’s preferred temperature series is the one that shows least warming. What, did someone mention cherries? The HadCRUT4 series is an improvement because it includes data from regions not covered in HadCRUT3, including many in high northern latitudes where warming has been most pronounced, and hence has less of a “cool bias” in comparison to GISS or NOAA, for example. The 1990s average anomaly was 0.22ºC, the 2000s 0.38ºC. In global temperature terms, quite a jump, and one well in line with expectations. For the “fast response” parts of the system. Sea level equilibrates over much longer time scales (we hope).